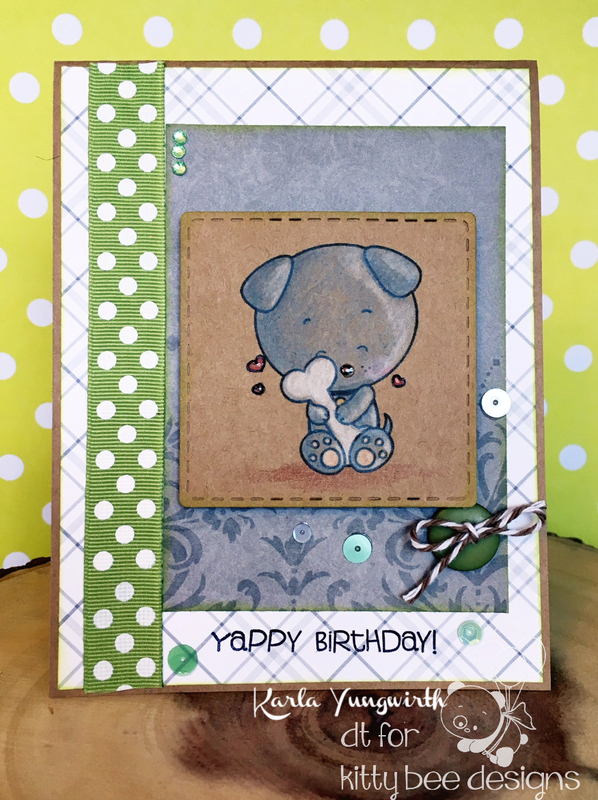 Karla Yungwirth Designs: Kitty Bee Designs - Puppy Love Birthday Card! Hello! I hope you have all been having a wonderful week! It seems the time flies, and my girls have been busy getting ready for Halloween and enjoying the lovely fall weather we've had lately. Today, I'm sharing an adorable puppy birthday card over at the Kitty Bee Designs blog - perfect for a little boy birthday! I'm using the super sweet Puppy Love digital stamp by Kitty Bee Designs. I just love printing my images on kraft cardstock and then colouring them in with my Jane Davenport Magic Wand colouring pencils! The grey and white plaid paper from a Lawn Fawn 6x6 paper pad coordinated nicely with the grey paper and green ribbon from a BoBunny Ephemera Pack. I've been enjoying using these lately with such a great selection of embellishments and papers all in one pack. The sweet sentiment from the Fur Baby stamp set from Pretty Cute Stamps worked perfectly for this card! I used a Kaisercraft stitched square die to cut out the puppy and added some Glossy Accents to the hearts and nose for a bit of dimension. Some sparkly sequins from SpiegelMom Scraps add some coordinating colour and interest. Inside, I used a few more stamps from the Pretty Cute Stamps set and added some more shiny sequins! How cute is the 'party' sentiment?!! Thanks so much for stopping by today! I hope you have a fantastic week ahead! Such a sweet card. Love your perfectly colored pup. So glad you could join us for Viva la Verve.